One of the most important qualities we can teach our children is kindness. It’s the quality that I appreciate in others more than almost any other quality. Kindness speaks to our hearts and soothes our souls. A word of kindness at the right time can heal a wounded heart or encourage a broken spirit. Kindness is not usually the natural way of people. It’s certainly not always the easiest way to go. Chuck Swindoll once said, “Life is 10% what happens to you, and 90% how you react to it.” This is probably the most significant quote I have ever read and I teach it to others often. I have found (in my enormously long life) that life is hard and that people are mean. The only way to make it through it is to choose how to react to it. Take back the control. Treat other people differently than they treat us. Choose to see other people through the eyes of compassion. MODEL IT IN YOUR HOME. In our home, we try to be very careful how we speak to each other. We don’t use rude words. We don’t yell. We try to model kindness in our speech. We use the words ‘please’, ‘thank you’ and ‘excuse me’ – even when asking our kids to do something – even if they’re making us crazy. This may seem simple, but I promise it will rub off more than you can imagine. We also fight fair. We don’t yell or scream at each other (it’s kind of a rule in our house). Sometimes we mess up, of course – but when we do, we apologize and forgive. We want our kids to know how to talk to each other in a kind way. Even when they disagree. Even when they’re hurt. We always say “you can be mad, but you can’t be mean.” I think it’s such an important thing for all of us to remember in relationships – you can be mad, but you can’t be mean. MODEL IT IN COMMUNITY. We want our kids to see people as people. Not as cars. Not as objects that are in their way. We want to see people as people – people with a family and a story. We talk kindly to people we meet and encourage our kids to be kind too. We open doors for people. We drive kindly (this is a big one for me – you are not a kind person if you drive like a jerk!). We also want them to think about other people’s feelings, so we talk about it a lot. When my oldest was in elementary and middle school (back when they were in public school), she always made friends with the ones that were ignored by everyone else or the ones that were picked on for whatever reason. Her heart is a kind heart. She sees people as people. She is never rude. I learn so very much from her desire that all people are loved and accepted. Truly. ENCOURAGE IT BETWEEN SIBLINGS. When my girls argue, it is almost always because someone is being selfish or thoughtless. When they bring the dispute to me (which they almost always do – and in the most dramatic fashion) I always ask 2 questions: 1) Are you being kind? 2) Are you thinking of yourself or others? They always answer honestly and they almost always immediately apologize to each other. I’m sure this won’t always work out this way, but for now I am treasuring it. A former pastor of mine taught us a phrase once that I have often used on my own kids. Whenever his kids would say “I didn’t MEAN to!” He would reply, “You didn’t mean NOT to.” Relationships require intentionality. Communication requires intentionality. We have to be purposeful and careful with our words to each other. Kindness is not always our natural, go-to reaction to other people – we must be intentional about kindness – especially in families! CELEBRATE IT IN OTHERS. Whenever we see someone being kind, we acknowledge it. 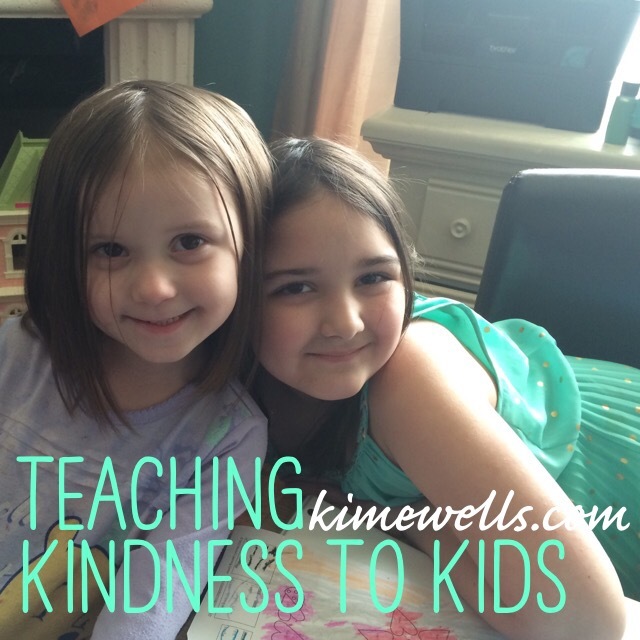 We want our kids to see how much we value kindness by celebrating it in other people. I am privileged to work with some incredibly kind people. Often I will come into my office and find a vase of flowers, a card, a gift, or a note of encouragement from either a co-worker or a ministry volunteer. I cannot tell you how much these acts of kindness mean to me. Every time it happens, I can’t wait to show my kids! I want them to see how the kindness of others has blessed their mom. I want them to see kindness as a gift so that they will want to give that gift away to others too! REMEMBER THAT KINDNESS IS FOR EVERYONE. I’m still learning this. I think I will always be learning this. There are always moments when I want to fight for my own rights rather than extend grace, compassion or kindness to others. I want to be kind, until fear or prejudice or selfishness gets in the way. I think everyone is able to be kind to people who are just like them – that’s easy. But what about those who are different? Or those we disagree with? Or those who have hurt us? That’s when the real work of kindness begins. I think sometimes that our kids understand the “no-matter-whatness” of kindness better than we ever could. Perhaps we could learn from them what it looks like to be the same kind of person to everyone we come across – regardless of our differences. We need to pursue the kind of kindness that will help us to see people – all people – through the eyes of a loving Father. If we want to teach kindness to our kiddos – we have to start by teaching kindness to ourselves. Let’s model it in our homes. Let’s model it in community. Let’s encourage it among siblings. Let’s celebrate it whenever we see it in others. And most importantly, let’s remember that kindness is for EVERYONE!